Stones a go go…the first of the stone holding the covers in place are removed. Anne and Scott come up with a game plan for the next six weeks in the new finds hut. 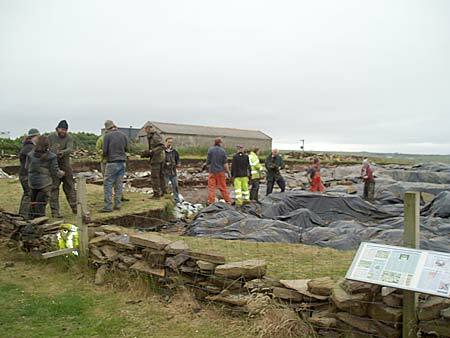 Welcome to the Ness of Brodgar for another season of stunning Neolithic archaeology. It’s hard to believe that almost a year has passed since this astonishing site vanished under billowing protective plastic sheeting and tons of rock. The last twelve months has been a thoroughly busy period of post-excavation work on the plans of the various structures and on the material remains which were recovered; the incised and coloured stone, the coloured pottery and the myriad remnants of all sorts left behind some five thousand years ago. If time permits, we will tell you more about this work throughout the next six weeks of blogging. The main actor in all of this is, of course, the site itself. You’ll be glad to know that it has weathered the winter well, which is more than can be said for some Orcadians (it was a long, dreich winter). It was great to see the advance guard of the excavation team assembled in the morning and to find familiar faces from previous years peeking out from under dripping hoods. It was raining (unheard of on the first day of the Ness! 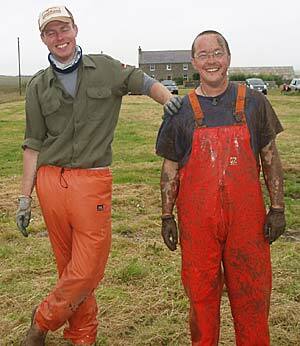 ), but nothing can dampen the enthusiasm of opening up a favourite site, especially one as extraordinary as The Ness. Life on the stone gang! The work of removing the rock and plastic sheeting proceeded well, although there were some anxious moments due to the gusting wind. At one point it looked as if Dave Reay, valiantly hanging on to a fistful of plastic, might well be transported to his home on the other side of the loch. By the end of the afternoon most of the plastic sheeting had been removed and site director, Nick Card, was clearly pleased by the work done. The serious work of primary cleaning and then excavation will begin on some areas in the morning. Nick’s primary focus this year is the emerging floors of many of the structures. These will be subjected to stringent and detailed sampling by a variety of methods, including XRF (X-ray fluorescence spectrometry), archaeomagnetic dating where appropriate and thin-section analysis. Spot the archaeologist who just had a close encounter with a mud-filled cover. Structure Twelve has still to reach the latest floor level but this will probably be accomplished by the second week. Given the extraordinary nature of some of the finds emerging from that structure, the analysis of the floors there will be fascinating. 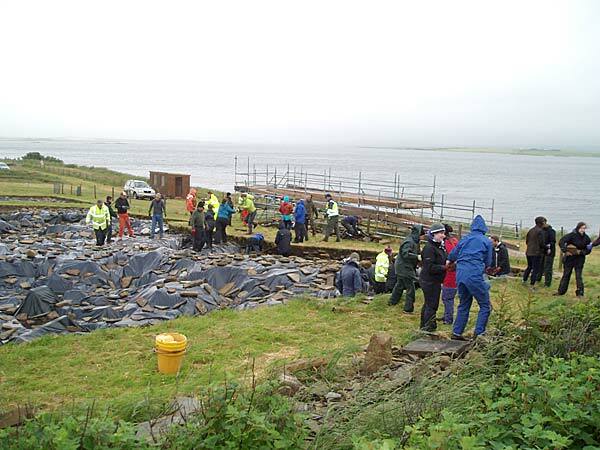 Another area of excitement is the opening up of a new trench on the other side of the house of Lochview from the main site (to the south-east of the house). Dan spent this afternoon with a bundle of marker canes, laying out the salient features of this area by converting the results of earlier geophysics to GPS equipment and accurately placing the canes. This has to be done with great care in order to avoid trespassing on the parts of the site which have been scheduled by Historic Scotland. The digger-driver will arrive in the morning and will delicately remove the turf to give the earliest indication of what might be beneath the surface. Elsewhere, Antonia’s jaw dropped with astonishment to find that some of the stone weights removed from the plastic appear to have incised marks on them. It is not surprising that on a site as big as the Ness some artefacts will slip through the initial net, and it is only due to the sharp eyes of Georgie and Woody that these were noticed at all. It all contributes to yet more material for Antonia’s burgeoning PhD on prehistoric stone art. The overnight forecast promises heavy rain. Let’s hope it’s not still here in the morning.